Here at Western Pacific Electric Inc, we specialize in a wide range of electrical projects, from design build, to industrial, commercial and residential projects. We also have a full service department that can help with any of your electrical problems on the go. With our many years of experience, the job will get done in a timely, efficient, and professional manor. The residential work we offer will leave your house looking its very best. The electrical work that we can provide comes in a wide range. We can do panel replacements, trouble shooting, installation of electrical devices, indoor and outdoor lighting, and fixing of wiring issues. If you are looking to have a home theater done, TV cabling, or a fire system installed we got you covered! Commercial work is done here with pride at Western Pacific Electric Inc. We have worked on many shopping centers, apartment buildings, and hotels! In these buildings we do lighting retro fits, installation of electrical devices and equipment, data drops, data cabling, panel changes and panel inspections! 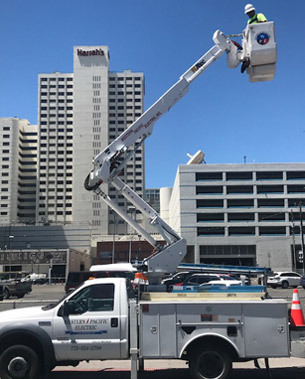 You may have seen some of our work at the Atlantis Casino Fountains, Casino Fandango Marriott Courtyard Hotel, TJ Max at Legends Mall, Sharlands Apartments, and many more! Design build projects are done to the customer’s satisfaction. We help in assisted owner designs and remodel projects. We also help with new construction projects. Some of the design build projects we have assisted with are Sierra Slot Source LLC, 25,000 Sq’ manufacturing plant, Equiterra Properties, Silver Lake Warehouse 50,000 Sq’, and Dynasty Gaming 25,000 Sq’ warehouse and office. Industrial work is for the heavy electrical jobs. We have worked on many projects ranging from pump stations, processing plants, sewer and pump plants, and water treatment plants! We do everything from fixing problems, electrical installation, motor control, panel changes, and panel inspections. We have done various industrial jobs, which include Quill Ranch Water treatment plant expansion, Truckee Meadows Water Authority pumping stations, and Siller Ranch booster pump stations. Our service department is for electrical problems on the go. We do trouble shooting of all electrical aspects. From lighting problems, lighting controls, equipment controls, motor controls, conveyor systems, and panel change outs! We even do parking light maintenance work.